Complete the look and functionality of your beauty hair salon or barber shop with an all-purpose barber chair. 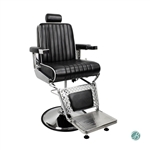 These chairs are ideal for haircuts, trims, threading, waxing, make up and more; since the features of any good barber chair is that it fully reclines for shaving and threading, the hydraulic pump allows for height adjustment, and an adjustable headrest provides comfort. All barber chairs and all-purpose chairs are also built with armrests and footrests. Comfort is key in customer satisfaction so allow Source One Beauty provide an all-purpose barber chair at an affordable and discounted prices. Barber chairs are now available in a variety of shapes and sizes, ranging from classic barber chairs, vintage chairs and retro barber chairs. Shop with us for Gamma & Bross chairs, Paragon barber chairs, Creations barber chairs and for many more brands for all your equipment.